About us | Infonet Biovision Home. Infonet-Biovision is one of the channels of the Biovision Farmer Communication Programme (FCP), it provides a database with scientific and practical validated information and knowledge related to plant (crop), animal, human and environmental health. The resource gives farmers, trainers, students, and extension workers quick access to up-to-date and locally relevant agricultural information and related topics. Infonet-Biovision's ultimate aim is to contribute to poverty reduction and environmental protection by disseminating appropriate and locally adapted methods to increase human and animal welfare and health, improve regional and local food security and at the same time conserve the environment and biodiversity. The information presented is specific for East Africa but is accessed worldwide and useful for many tropical countries. Infonet helps to bridge the digital divide between the users and researchers by translating and availing scientific and hard to comprehend information into more user-friendly formats. It also complements the other FCP channels: The Organic Farmer (TOF) Magazine, The Organic Farmer Radio, The Farmer Communication Outreach and the Mkulima Mbunifu programme which have more localized articles, commentaries and a farmer SMS service. Infonet contains a relevant and limited range of carefully selected topics which contribute to a sustainable livelihood, namely on agriculture, livestock welfare and health promotion, and environmentally safe technologies. Through this holistic approach we have the greatest potential to improve the rural populations life and generate income while at the same time protecting the environment and the natural resources. To date, Infonet has over 3,000 printable A4 pages of most recent, scientifically proven, illustrated and easy-to-understand information about ecological and sustainable methods and applications, for prevention and control of pests and parasite infestations of plants, humans and animals; adjusted on East African conditions. Infonet is set to grow through revisions and addition of new content! Biovision Foundation is a Swiss non-profit organization with a global mission to alleviate poverty and improve the livelihoods of rural people in Africa while maintaining the natural resources and diversity that sustains life. Our chairman is Dr. Hans Rudolf Herren, one of the world's leading researchers in biological pest control. He has been living and researching in Africa for over 20 years. In 1995 he won the World Food Prize, the first Swiss to receive this honour. From 1994 until 2005 he has been the CEO and Director of the International Centre of Insect Physiology and Ecology (icipe) in Nairobi, Kenya. In May 2005 Dr. Herren officially took over presidency of the internationally active Millenium Institute in Washington DC. This institute supports the governments of developing countries by providing resources for sustainable development. While icipe plays a major role in the control of pests, parasites and disease vectors in developing countries. Biovision Foundation functions as an intermediary between research institutes and local users in order to ensure that benefits of science reach the people who need them most. Biovision Africa Trust is a not-for-profit organization founded in Nairobi in 2009 by Biovision Foundation for Ecological Development, Switzerland. The Trust aims to sustainably alleviate poverty and improve livelihoods of rural communities in Kenya and throughout Africa. To achieve this, the Trust supports ecologically sustainable agriculture projects and initiatives that focus on the generation and dissemination of ecologically sound and useful knowledge and information on human, animal, plant and environmental health areas. iCow is Kenya's largest mobile agricultural platform, developed for small scale farmers, accessible by every mobile phone including feature phones and smart phones. Features include tips on sustainable agricultural practices, livestock gestation and growth calendars, access to agricultural extension service experts, tips on crops, climate resilient farming and much more. iCow farmer library is available on the short code *285# in Kenya on Safaricom network. The project team works closely with scientific experts from icipe, FIBL and others. The scientific advisory board contains experts from Human-, Animal- and Environmental Health. Ecologically sound means measures that promote sustainable production of food, feed and fiber. These measures will improve soil fertility over time, and pay attention to the multifunctionality of agriculture and assure the provision of ecosystem services. How do I order the USB flash drive (Infonet-offline Version)? The Infonet-USB is useful if you do not have internet access but have access to a computer to read the Infonet-USB. Please note that the USB Flash disk is only produced once a year and does therefore not contain the latest and updated contents, the most updated version of Infonet is only accessible through the internet. In East Africa, agriculture is the main source of income for over 70% of the rural population (in Kenya about 20 million people) and represents 25% of the region's gross domestic product (GDP). Most of the farming is small-scale or subsistence. Crop pests (insects, weeds, plant diseases, rodents etc.) represent a considerable limiting factor in the production of local food crops and are a major cause of agricultural under-production, malnutrition and poverty. At the same time the workforce is plagued by the major health problems that arise from numerous diseases caused by parasitic infections in humans (HIV/Aids, malaria) and productive livestock (tsetse-born trypanosomiasis, tick-born East Coast fever). Despite agriculture's significance, the rural population in Africa often lack access to extension services, productivity augmenting techniques and know-how. In particular, up-to-date information on affordable, effective and ecological methods for the sustainable management of plant-, human- and animal- targeting pests and disease vectors, for adequate nutrition, as well as methods to maintain a healthy and productive environment lay dormant in academic journals and research institutes, beyond the reach of farmers and rural communities that need them the most. To actively support dissemination initiatives at the icipe and other organizations in the area of agriculture and health, Biovision provided the initial finances in order to begin preliminary work on an Internet platform whose purpose was to act as a tool for information sharing and dissemination of knowledge and experience gained in various pilot projects. Later the Liechtenstein Development Service provided funding to proceed the work for Phase I (2005-2007) of implementation.The design of Infonet-Biovision incorporates a bottom-up approach in the sense that the topics, content and structure of the platform was defined in consultation with local farmer groups and communities. Infonet-Biovision also encourages user's feedback on experiences and on the situation on-the-ground which eventually is lead back to the board of advisory scientists so that the information presented can be continuously adapted and expanded. This two-way flow of information is an integral aspect of ensuring the applicability, relevancy and usefulness of the platform. For effective outreach, Infonet-Biovision collaborates with Biovision Farmer Communication Outreach Programme* as well as with other training and extension networks in the field of sustainable agriculture, environment, livestock and public health. We aim to collaborate with organizations which have experience in awareness raising and sensitization for farmers and rural communities in East Africa. In addition, such collaborators ought to be receptive in in using new information and communication technologies to disseminate the necessary information to farmers and rural communities. We are aware that access to computer, literacy, language and cultural differences are major limitations in reaching the defined target groups. Therefore, we endeavor to collaborate with organizations that will translate relevant information into local languages for an effective transfer of information. We are also aware that the internet can only become an established medium for the transfer of knowledge if it is used by existing institutions and access points and if it supports their work.Infonet-Biovision has the potential to increase the impact of existing training and extension programs from GO's and NGO's as it can be easily combined with various existing local approaches. To ensure that the information reaches the end-users directly, a wide range of media such as posters, brochures, local radio, marketplace and other "low-tech" media are used. *Biovision Farmer Communication Outreach program has 25 field extension agents who train farmers and enable them to access and use internet, print, audio, video and other electronic resources on ecologically sustainable agriculture. These field extension officers are distributed in 11 Farmer Resource Centers which are a one stop information hub for farmers. The farmer resource centres are located in Bungoma, Eldoret, Gilgil, Kagio, Kakamega, Kangundo, Kinangop, Kisii, Lengo, Machakos, Maragua, Murungaru, Shinyalu, Singi, Tiriki, Turasha and Wanginge. The sustainability of the platform largely depends on the ability to bring the information to the farmers and to ensure the relevancy of the information provided. The project is characterized by a participatory approach involving farmer groups, local collaborating partners and communities. The core concept of Infonet-Biovision is the database with its processed information and pre-defined structure which facilitates the rapid and easy incorporation of new data. As the needs of users with varying levels of knowledge and experience ought to be catered for, the platform around the database is conceived in such a way that the users can access its content through different entry points. These include databases on sustainable pest and crop management, animal, human and environment as well as training modules in these areas. Furthermore, it will be possible for the users to send feedback information to the project team-members regarding their experiences. 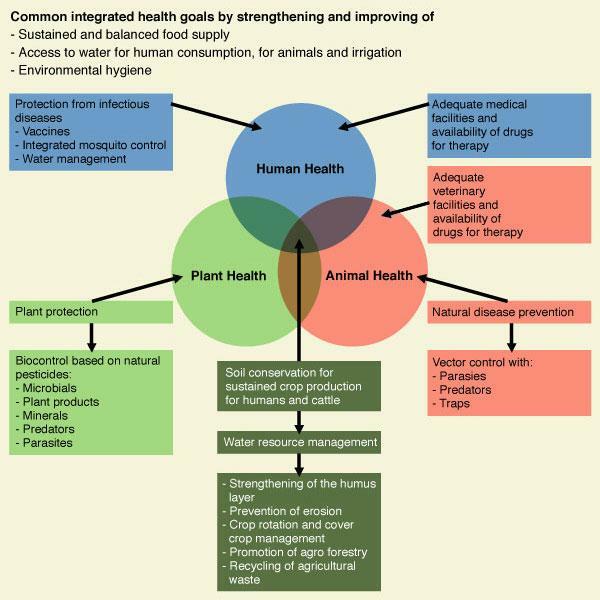 The platform provides comprehensible content with up-to-date information on preventive and curative control of plant-, human- and animal- targeting pests and disease vectors and on sustainable agriculture and environmental health. Where available, effective traditional management methods will also be incorporated. With the use of photos, images, illustrations and clear advice, we provide practical tools for the correct identification and recognition of pests, disease vectors and parasites and their damaging symptoms. Such information is also useful to non-experts. All information can be compiled, saved and printed in tailor-made training material by users. In all categories, external web-links lead to related web-sites with additional information. Methods shown at the bottom have a long-term effect, while methods shown at the top have a short-term effect. In organic farming systems, methods with a long-term effect are the basis of crop production and animal husbandry and should be used with preference. On the other hand methods with a short-term effect should be used in emergencies only. In human health, preventive measures reduce peoples' dependency on medicine and drugs. They include the provision of safe water supply, sanitation, the promotion of safe food supply, proper nutrition as well as other environmental control measures. In the plant health part the database contains biological and ecological background information, scientific and local names, images and photographs used for the identification of pests and diseases. The description on the prevention and cultural measures which have long term effects is also provided. This is then followed by direct control measures such as Bio-control Agents and Bio-Insecticides which have short-term effects. The data on preventive control measures is the core part of the information we provide.In organic farming systems, methods with long-term effects are the basis of crop production and animal husbandry, and should be used with preference. On the other hand, methods with short-term effects should be used in emergencies only. Infonet-Biovision has extended this approach to human health systems. This is because the advance in the development of vaccines and chemotherapeutic agents has brought many diseases under control. However, there are still many communicable diseases for which environmental control measures are indispensable, especially in the field of water supply and sanitation. Such diseases include cholera, diarrhoeal diseases, leishmaniasis, malaria and schistosomiasis. In all these instances, the environmental measures, either as an integral part of primary health care or undertaken outside the health sector, form an indispensable component of overall disease control strategies together with education on health and hygiene. In some cases they are the only component. Many organizations in tropical countries, probably most of them NGOs, are engaged in training activities on sustainable agriculture or related topics. The idea which led to the development of Infonet-Biovision was to facilitate dissemination by making suitable material and approaches available over an internet platform. Already existing material was to be collected, screened and condensed into comprehensive information items, which could be made easily accessible. In order to guarantee the optimum implementation of the project, various experts are involved in the project. We have built up a team of international and local experts involved in the early conceptual and content development phases and in the monitoring and evaluation phases. The scientific advisors are specialised in particular fields for the review of all information provided on the platform. From the contributing partners, several were selected for active collaboration in the development and review of the contents. The development of this platform was a much bigger, longer and more exhaustive process than expected. The result is supposed to be a start of a continuing process. Infonet-Biovision shall be a living information platform, modified and further developed by those who use it. The source of information is derived from Biovision projects, research institutions, project reports, books, publications, web-sites and partner organisations in East Africa as well as from local farmers' groups and communities and extension workers' feedback. The application is compatible with Windows (tested), Macintosh and Linux. The Operating system is Ubuntu Linux version 16.04. Resides on an Operating system installed on a virtual private server(VPS). A relational database is used at the backend. At the moment we have MySQL version 5.7 implemented. MySQL runs on different platforms including Windows, MacOSX and different Unix-Versions. It should be possible to use other relational databases with acceptable change effort. Content management for the Infonet is via a content management system (CMS). The content management system is Drupal version 7.59. Text, illustrations and photos, elaborated within the Infonet-Biovision framework (marked with (c)Biovision or (c)icipe below the text or image) are provided freely to Infonet users under the condition that the source and author is provided and only for non-commercial uses. It is published under Creative Commons Attribution - Noncommercial - Share Alike license. Publications, images and graphics that are provided by third-party publishers and partner organizations (marked with (c)Author other than Biovision or icipe below the text or image) are not available under Creative Commons. Biovision Foundation is attempting to offer information of sound quality to the users of the online platform and information service, Infonet-Biovision. Due to the fact that ecological approaches cannot be standardized because of the diversity of local factors influencing its performance, Biovision does not assume any responsibility for damages which may arise from the use of the information presented in Infonet-Biovision. This covers any direct, indirect or consequential damages.Biovision Foundation encourages the users to test the information presented first on a small scale within their location with the aim to study the performance of the presented information under local condition and to adapt it, if necessary. This local validation should be conducted in cooperation with competent local partners.Note: Hyperlinks to other Internet sites do not imply any official endorsement of or responsibility for the opinions, ideas, data or products presented at these locations, or guarantee the validity of the information provided. The sole purpose of links to other sites is to indicate further information available on related topics. This site is founded and hosted by Biovision Foundation in the canton of Zurich, Switzerland. This site, its contents, and any disputes arising therefrom shall be construed and interpreted exclusively under the laws of the canton of Zurich and applicable Swiss federal laws.